Time to introduce the notion of an “algorithm”. From now on, there will be a handful of these algorithms that need to be learnt and applied. This concept is very similar and comes in various ways throughout education and even in most professional lives. The first algorithm is to complete two layers. It is quite simple and there is much joy when your child completes two full layers! Enjoy and reward the persistence (after the algorithm is fully memorized). The final layer is challenging. The first step is to teach how to just position the corners at the correct place. This involves careful observation of the colours to find a common colour other than the top layer colour. Once the pieces are positioned at the appropriate cube face, you have to figure out the “swap 1 & 2” algorithm. This algorithm is a bit tricky with new moves of rotating the cube faces, etc. Again, the success factor is being careful and following a given set of instructions carefully (that’s what an algorithm is!). At the end of it, recognize that the corner pieces are all in the correct positions but not necessarily twisted correctly. The next step involves a neat little algorithm called as the Sune (all there in the instructions in step 1). You have to learn both the “right” side and the “left” side of the algorithms. See the benefits? (Pattern recognition, similarities except for right/left variations, etc). After #7 has been done properly, all the corner pieces are in place. Only the four “edge” pieces remain. There is another pair of symmetrical algorithms to make sure that the “edge” pieces are properly positioned. Learning involves recognition of the patterns to see which variant of the algorithm to apply (clockwise or counter-clockwise). Finally, you have the dreaded “Dedmore H, Dedmore Fish” algorithms to learn, memorise and apply. The joy and learning for your child in persisting and completing all the 10 steps are immensely significant. Reinforce the notion of working long and hard before you can savour the rewards of that hard work (i.e. delayed gratification). A job of the above complexity will make things like additions, subtractions, multiplications and divisions seem trivial. After all, they are much easier “aglorithms”, right? 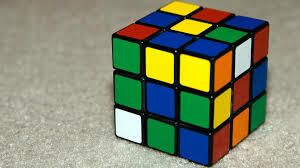 This entry was posted in Free Flowing, Parenting and tagged algorithm, algorithms, delayed gratification and parenting, Teaching Rubik's Cube to kids. Bookmark the permalink.